A team of Russian divers from the expedition 'Antarctica 100' have jumped 97 meters deep into the crater of an active Antarctic volcano. 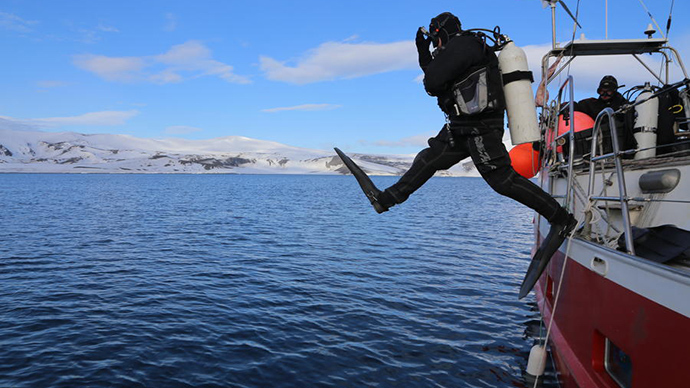 The seabed plunge in extremely cold water marked a world record, and served as an important test of diving techniques. The expedition departed on a sailing boat from the Argentinian port Ushuaia to the Southern Shetland Islands in early December, with the aim of devising methods of safe diving in cold waters and testing new experimental equipment for diving. The team reached its destination – Deception Island, which is a caldera of an active volcano – after several days of sailing, but was then faced with a severe storm. In the end, the divers only had eight hours to carry out their long and complicated jump, as the weather wouldn’t allow for more time. Aiming for a depth of 100 meters, the exploreres reached the seabed at the 97 meter mark. “The working depth for diving in Antarctica is 20m. No one has dived deeper. We have dived twice – 97 m and 45 m deep,” team leader Dmitry Schiller said. The divers remained in the volcano’s deep for five minutes, which was enough time to hold tests and take samples from the seabed. The temperature of the water was three degrees below zero. It took the team 71 minutes to go up, due to safety procedures. Schiller explained that in order to avoid dangerous decompression sickness – which can literally make the blood boil – part of the team had to change their diving tanks with the help of others, before going deeper. Those tanks contained breathing gas of a different composition. The second dive was made only an hour later. The expedition managed to test a new regulator and dive-computer, both of which were designed and produced in Russia. However, the team members said the toughest challenge for them was not the dive itself – but their journey back. The expedition, organized by the Russian Geographical Society’s branch in the Republic of Tatarstan, returned home on Thursday. The team consisted of 10 people; the youngest was 18-year-old Valery Saleyev, and the oldest was Andrey Filippov, 48. Saleyev used the opportunity to take a selfie while making his deep dive. The team has made a request for Guinness World Records to record their dive, but their achievement has already been recognized by CMAS – the International Federation of Underwater Activities, founded by the famed Jacques-Yves Cousteau and based in Monaco. The team members say this recognition is much more important for them.